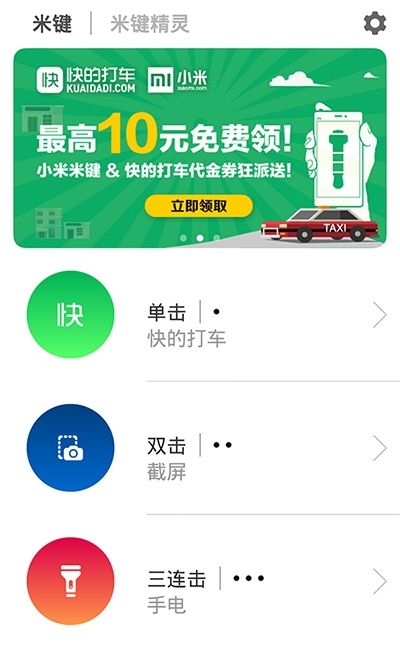 Mi Key, the Pressy-like programmable physical button for Android devices developed by Xiaomi, has integrated Kuaidi, one of the leading taxi apps in China, that the latter can be opened with one button click. If there’s no Kuaidi app in your Android phone, the Mi Key’s accompanying app will direct you to an app store to download and install it. Mi Key was launched in April this year as one of the Chinese clones of Pressy — The others include Qihoo 360’s Smart Button and Quick Button. Those Chinese buttons have similar functions with Pressy’s, such as taking photos, switching on the torch and capturing screenshots. The Xiaomi Mi Key is sold for RMB4.9 (about US$0.8) — cheap enough. Xiaomi said more integrations with third-party services like Kuaidi will be available later on. The Qihoo’s button and Quick Button have been merged — It is reported that the former had invested the latter, and Qihoo decided earlier this month to give them away, hoping to have users adopt the company’s software products that have been integrated with the buttons or will be added later on, or channel users to other services of the company.